Although we all think about December as a season of giving, more trash will be generated this month than any other time of year. That’s not a gift the earth wants to receive. One simple way to reduce our waste is to reuse what’s already here. Although most of us probably are using reusable grocery bags by now, there are still gazillions of plastic grocery bags (technical term) used every day. Since they’re out there anyway, here are some ideas to reuse or re-purpose them. My husband eschews every cloth lunch bag I attempt to give him; he always prefers a plastic grocery bag (so classy, right?). I know some people let their garbage go “commando” without any liner, but there are some things I don’t want touching my garbage can. I’d rather throw away a plastic bag than waste water and my time cleaning the can every week. When folks are leaving your house trying to carry a few items they’re borrowing, it’s helpful to be able to offer a bag for them to toss their things into. Same goes for delivering food or gifts to others’ houses. I now have a “wet bag” for diapers, which is great, but I used to always have a few plastic bags in the diaper bag. It’s much more polite to bag your poopy diapers before tossing them at a friend’s house, or better yet, take them home with you. I prefer to used bread or banana bags rather than grocery bags, but in a pinch, they’re great. I still keep one in the diaper bag for emergencies when I leave the wet bag at home. 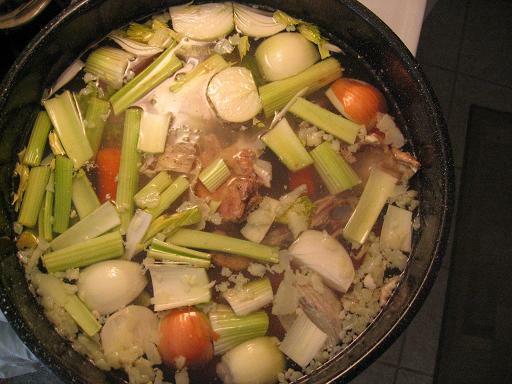 If you make homemade chicken stock, you know the mess that you have to throw away. 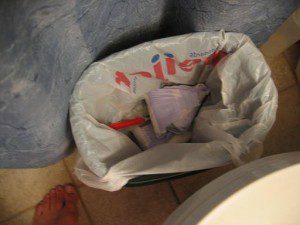 I find it helpful to contain the juicy waste in a plastic bag to make an attempt at avoiding leaky, greasy messes on the bottom of the garbage can. Sometimes you also just have to take some food waste directly out to an outside garbage and need a container. Sure, you can buy a nice mesh bag with a drawstring made specifically for bagging your own bulk produce, but those beauties are pretty expensive. Until you feel the need to fork over $10 for 3 bags, just reuse plastic grocery bags (or the produce bags themselves) until they get something sticky or gooey on them. At that point, use them for use number 5 before throwing away. Don’t you agree that cleaning up can be the longest and most arduous part of painting walls? 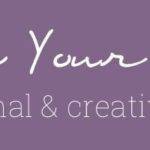 Between coats or when interrupted by well-meaning children or other responsibilities, just stash your brushes and rollers into a plastic grocery bag, tie the bag handles around the brush handles, and pick up where you left off. I can only guess how many gallons of water we saved using this trick when painting a few rooms recently. Bonus idea: For a free drop cloth, cut open dry cleaning bags and lay flat. 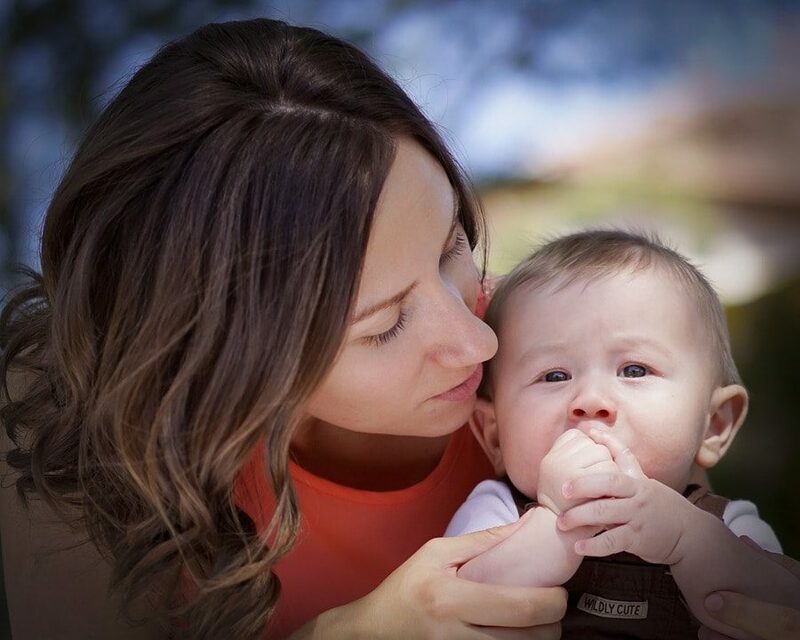 Unless you have a wet bag of some sort (expensive if you’re not doing cloth diapers), there are many occasions when wet swimming suits or other items (winter gloves and hats come to mind) need to be transported. 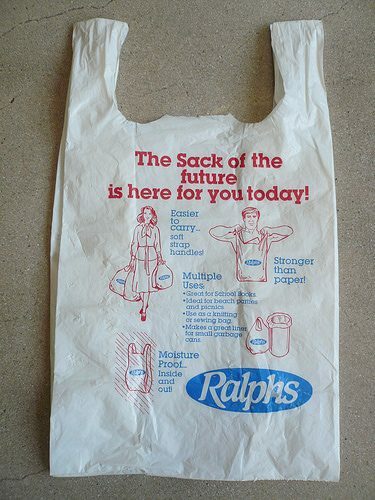 A plastic grocery bag is the perfect disappearing size to have along for any opportunity. Every suitcase in our house has a grocery bag permanently tucked into the front pocket. Separating dirty clothes before coming home makes laundry so much more efficient. Although I don’t have a pet, I see people carrying grocery bags for poop pickup when they walk their dogs. However, it strikes me that that’s throwing away a lot of plastic bags. I would hope an eco-friendly family couldn’t even generate the quantity needed for a twice daily dog walk. I’d rather see the bags sit in the car for an emergency stop and use one of those shovel scoopers for regular walks. I have plastic grocery bags in my freezer for smoothie supplies, baby food cubes, shredded cheese, and more. This way I can move items around more quickly (3 or 4 bags to grab instead of 10 or 20 Ziplocs) and keep like things together. My smoothie making has become much more efficient since I started putting all my supplies together, even a little package of kelp powder that doesn’t need freezing. Particularly in urban schools, you’d be surprised how many kindergarten students don’t have backpacks. Many teachers I know keep a stash of plastic grocery bags to contain notes and homework when a child is without. Art classrooms can also often re-purpose many “trash” items; just ask your teachers or principal if there’s a need. 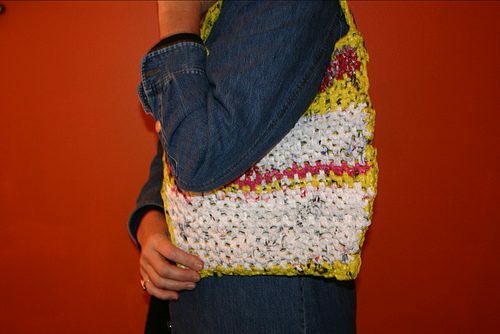 Have you seen plastic grocery bag purses and mats? Some people are so creative. You can weave plastic bags into mats for the homeless, crochet bags into sleeping mats for third world countries, or just make a tote bag or children’s play mat for your own home. I saw some sitting mats at our children’s museum during an outdoor performance, and let me tell you – they’re super cute and functional. Plastic bags can keep like things together and provide some padding when storing holiday items and other pretties you aren’t currently using. We all know Styrofoam packing peanuts are no good. So, reusing those is best practice. If you don’t have any on hand, plastic grocery bags can keep your packages safe while they travel. Just ask the person on the other end to reuse or recycle them, too. 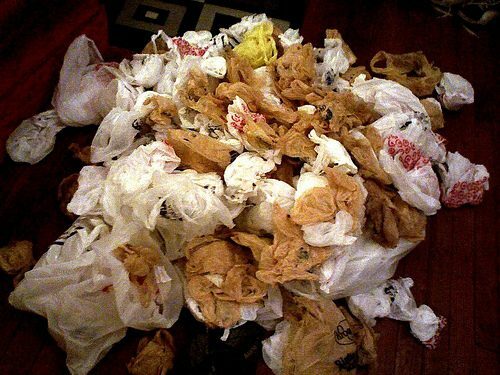 I know a lot of these functions can be accomplished with paper or cloth bags, but as long as plastic bags might come into your house (or you still have a stash from when you used them, like I do), you might as well re-purpose them before recycling. How do you reuse and repurpose bags that end up in your house? Next PostShould We Stock Up on Incandescent Bulbs? Paper bags can have roaches or there eggs on them. As a cashier, I can’t tell you how many times I’ve seen roaches in the unused paper bag area. or you can stop being so cheap and buy a couple of extra pillows who the hell wants to sleep on a bunch of plastic bags? I take them to a thrift store. Some re-use them for customer purchases.